MINI has revealed official details and pictures of their upcoming MINI Roadster, the open-top version of their also recently launched Coupe. Just a couple months ago, MINI unveiled their new MINI Coupe, which was basically a modified version of the popular hatchback model. And while many aren&apos;t fans of its unusual backwards baseball hat roof design, the newly launched roadster version is, in our opinion, a nice improvement. Set to go head to head with the popular as ever Mazda MX-5, the soft-top version is the sixth model that&apos;s now been added to the MINI line-up. It&apos;s also the first open-top two-seater in the brand&apos;s history. 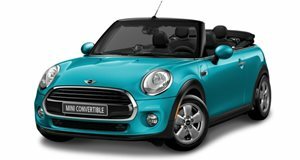 Just like its coupe sibling, the roadster is based on the current generation Mini hatchback so its dimensions are nearly identical to that of the Mini Convertible. The main difference between it and the convertible is that the former has only two seats, a more steeply raked windshield and a lower ride height. Because of the lack of rear seats, the trunk&apos;s space capacity is now nearly doubled. So how does it drive? According to the automaker, it has the same go-kart like experience as the coupe due to its lower center of gravity, bespoke chassis set-up, improved rigidity and optimized aerodynamics properties. With the exception of the softtop, MINI claims there are no other major changes to the Roadster from its Coupe sibling, as the same engines are being offered. For Europe, the Roadster will go on sale next spring with a base 1.6-liter 122hp gasoline engine. The Cooper SD is powered by a 143hp 2.0-liter turbo diesel and the Cooper S has an 184hp 1.6-liter turbocharged gasoline engine. The John Cooper Works version has the same 1.6-liter turbo that produces 211hp. For North America, only the gasoline engines will be sold, with the diesel being a Europe only option. All engines will be mated to either a standard six-speed manual or a six-speed automatic. The JCW will come exclusively with the manual. Official pricing hasn&apos;t been announced, but will likely be revealed in the coming months just prior to the new Roadster arriving in dealerships.